When it comes to Facebook advertising, a big part of your success is based on how well you are targeting audiences. So lets look at how you can leverage the right audience types to sell on Facebook. There have been too many times where I’ve started working with a client to find out later that they haven’t had their analytics and conversion tracking set up properly. This is a very important aspect of your marketing, so make sure your Facebook Pixel is installed and working correctly. Also, ensure you set up your conversion tracking with Facebook conversion events. If your Facebook Pixel and conversion tracking aren’t properly set up, you will have a lot of problems later figuring out which ads are working and which ones are falling flat. It also means you won’t be able to properly generate some of the most valuable audiences you can re-market too. Side note: Make sure you have Google Analytics installed on your website as well. You’ll want to gather as many details as you can about site traffic, how long people stay on your webpages, etc. Saved Audiences are generated based on user demographics. You can target people by their age, gender, location, interests, behaviours and more by using Saved Audiences. You can even micro-target users with Saved Audiences. For example, you can target a specific age, gender, location, and employer (although it will cost you more if you are targeting a smaller group of people). We’ll go over how to properly leverage Saved Audiences later in this article. Lookalike audiences are audiences that are generated based on shared characteristics of another audience you choose. You can select the country or region the lookalike audience is generated in. The audience size can be adjusted with percentages from 1-10. The higher the percentage, the fewer characteristics your lookalike audience will have with your source audience, but the bigger the audience will be. The lower the percentage, the more closely your Lookalike Audience will be with the source audience you selected. 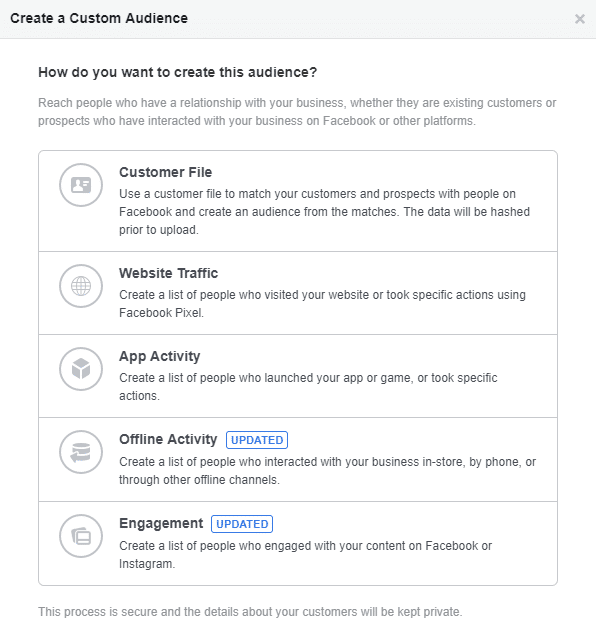 Custom Facebook audiences are generated based on a Customer File, Website Traffic, App Activity, Offline Activity or Engagement. These audiences are warmer audiences compared to Saved and Lookalike Audiences because they have already engaged with your business in some way or another. Import your email list or connect your Mailchimp account using the Customer File option. Facebook will then look to see if those emails are affiliated with people on the platform. If there is a match, they will be added to your Custom Audience list. Custom Audiences based on Website Traffic are some of my favourite audiences. 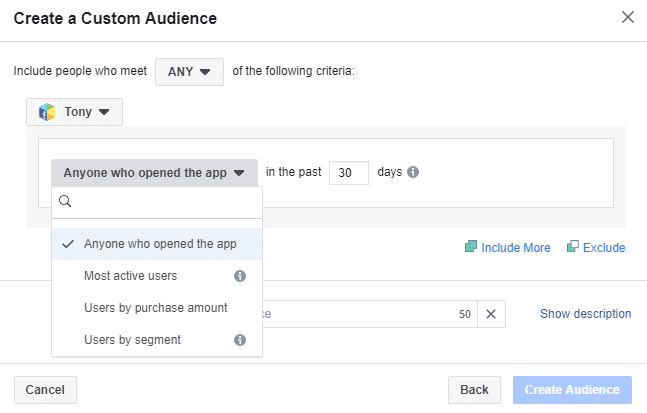 What’s great about these Facebook audiences is that you can generate them based on conversion events such as a purchase or ‘add to cart’. Another great use of Website Traffic audiences is to create a Custom Audience built with people that have visited your site in the last 30, 15, or 7 days. You’ll want to test variations of these and should check to ensure these audiences aren’t too small. If they are, you’ll be paying more for your ads. 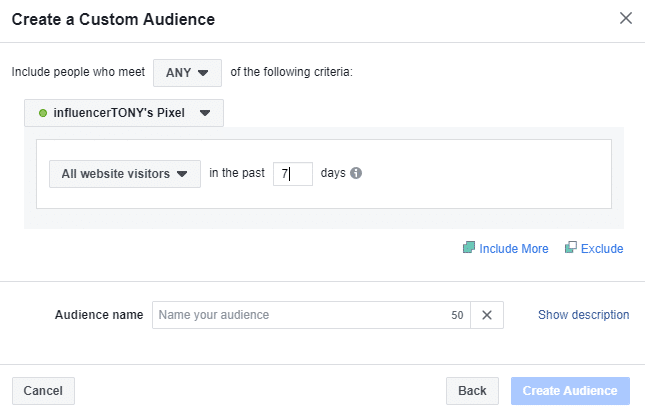 You also have the option to segment out different audiences based on pages they have visited, which makes re-marketing a piece of cake! This is great for clothing stores, for example, that can segment out men and women. Segmenting out audiences makes creating ads and personalising them easier. Note: Realise that the longer you wait to remarket to an audience, the lower your audiences’ recollection of going to your website will be. If you have a mobile application for your business, you can use the App Activity option to create audiences based on people that have interacted with your application. Like the Website Traffic option, you can select the number of days since your audience has opened your app or had an engagement with it. The Offline Activity option of Custom Audiences lets you generate audiences based on people that have completed offline conversions. This is particularly useful for business owners that have physical locations with POS systems. Again, you will need to ensure your conversion tracking is properly set up to leverage Offline Activity. Offline Activity is a great Facebook feature because it allows you to track real results from ads that have brought customers into physical stores. 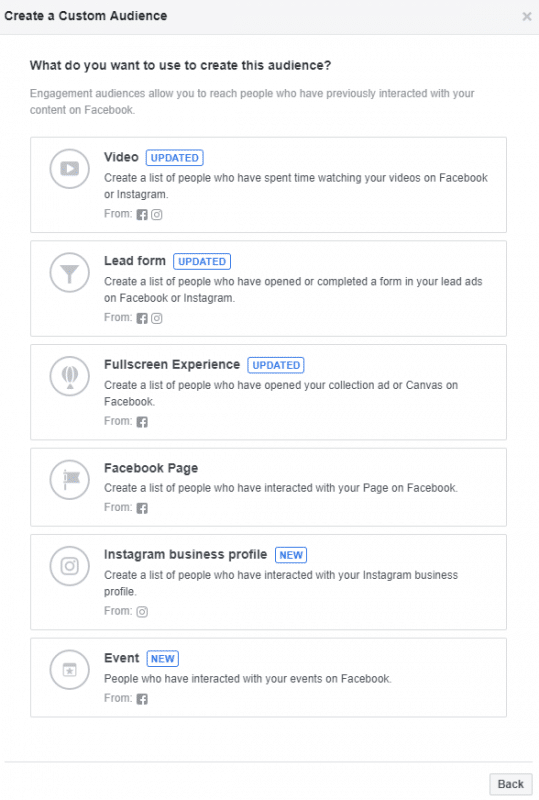 For more information on setting up offline conversions and the different integrations available, visit Facebook’s Offline Conversions page. The last option for generating Custom Audiences is to create them based on Engagement. Engagement audiences are key because these are people that are interested in your products/services in one way or another! 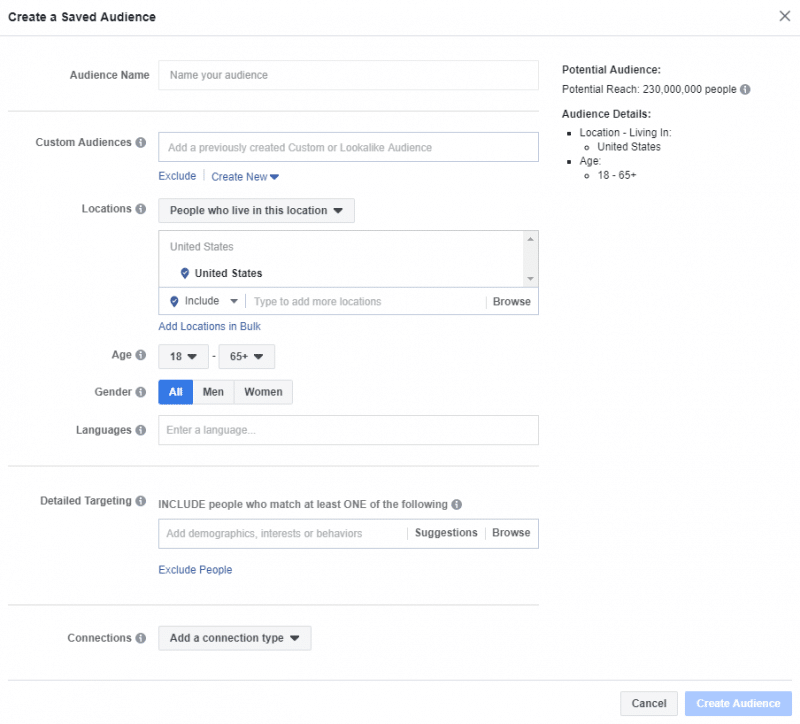 Now that you know about the three different Facebook audiences, let’s dive into how to leverage them for your advertising. 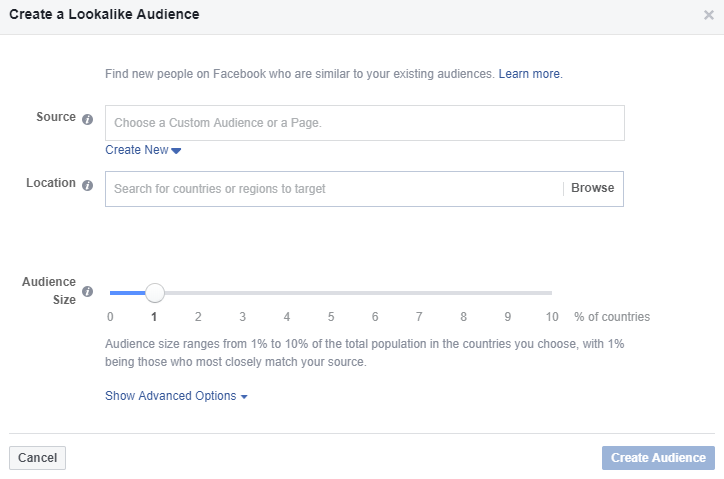 Which Facebook Audience Should I Use? I sadly hear a lot of people say, “Facebook ads don’t work” after they have tried them once without much success. One of the biggest mistakes I see business owners make with their Facebook ads is not marketing to the RIGHT audience at the RIGHT time. This is what I’ve seen as one of the top 5 mistakes business owners make with their Facebook ads. You need to think about your Facebook audiences in terms of where they are located in your funnel. 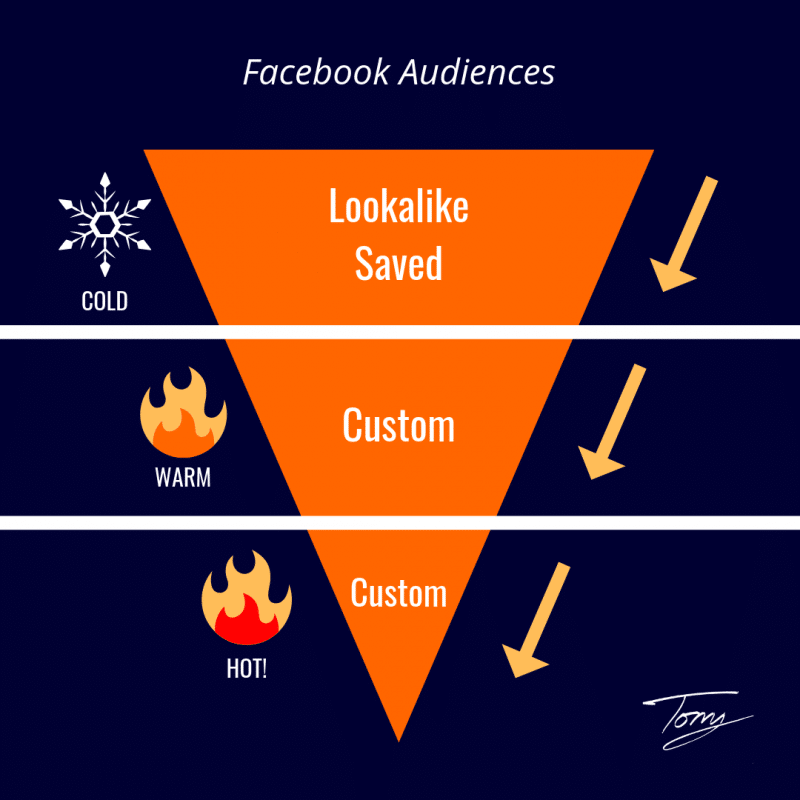 Saved Audiences (generated from demographics) are cold audiences you should market to at the top-of-funnel. These people are not familiar with your products/services, so you will need to warm them up with other ads. Lookalike Audiences (audiences that share characteristics of a chosen source audience) are cold audiences as well. Although they might be your ideal demographic, they still haven’t interacted with your business yet. 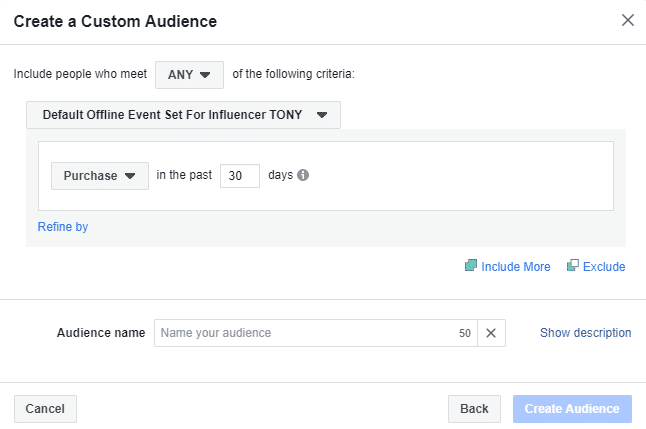 Custom Audiences (generated based on engagement with your website, socials, etc.) are warm or hot audiences to advertise to. These people have been to your website, they’ve interacted with you online, so they can be advertised to lower in the funnel. You must show ads to audiences based on if they are cold, warm or hot prospects. The key to audience targeting is to familiarise Lookalike and Saved Audiences with your brand. Then, re-market to the people that have engaged with your content. The common issue I see with businesses starting Facebook ads is they run bottom-of-funnel ads to cold audiences. Time and time again I see business owners running an ad to a Saved Audience that is trying to sell a product or service. Saved Audiences are cold audiences. If a person doesn’t know anything about your business before they see an ad, they just won’t convert! Saved and Lookalike Audiences aren’t familiar with your brand, your brand’s story, what makes your brand unique, etc. You have to warm these audiences up first! I want to sell more of my coffee on my website, so I create ads targeting people within 5 miles of my store’s physical location (a Saved Audience). My ad headline says, “Buy 2 Bags of Coffee, Get 1 Free” to try and lure people to buy from my online store. A week passes and now I’m frustrated because we haven’t even sold one bag yet! None of the people I’m targeting know about my business! They don’t know if I’m trustworthy, what my personality is, what the quality of the coffee is, etc, so ordering from my store is a risk in their eyes. Don’t sell to people that don’t KNOW, LIKE and TRUST you first. 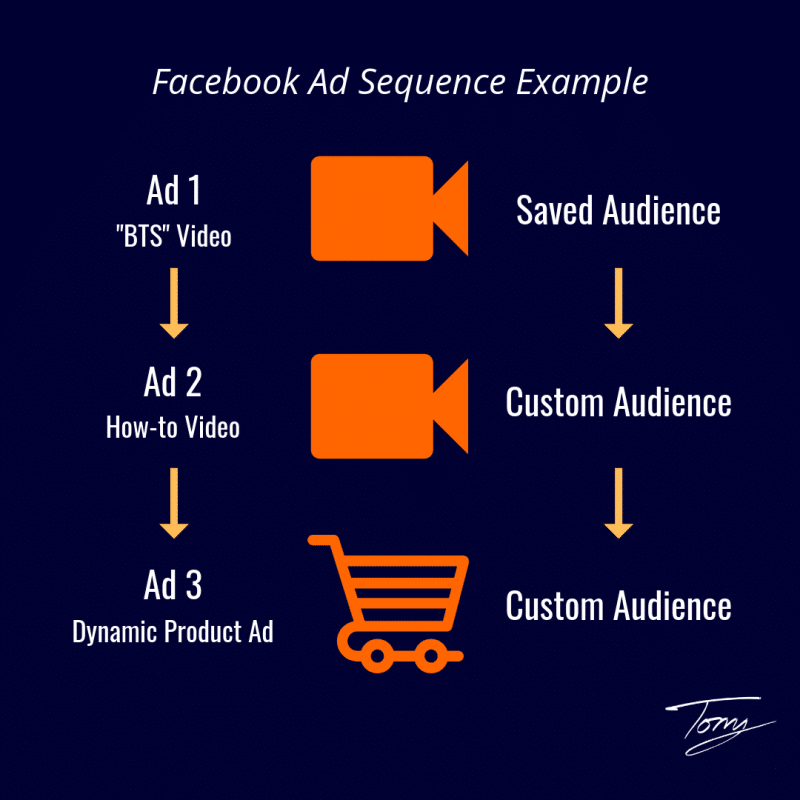 Instead you should create ads and sequence them to customers as they go down your funnel. I’ve learned from my mistakes now and I am ready to give Facebook ads another shot. So, now I know that Saved and Lookalike Audiences are colder audiences, so I’m going to advertise to these people much differently. Now, my ads targeting people located within 5 miles of my business consist of videos. In the videos, the Saved Audience gets a first-hand view of my brand new shiny store, I take them “behind-the-scenes” to see how our coffee is made and I briefly speak about what makes our business unique. That’s the first ad in the sequence… I’m not pushing for the viewer to buy yet because we just met. However, after watching my video they now KNOW about my business. For my second ad, I want to provide value to my warmer audience. I create another video that shows people how to create a perfect coffee bar at home. 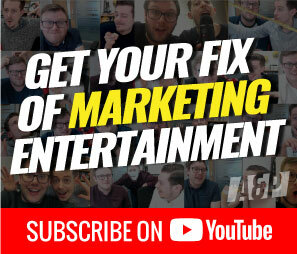 This ad will target people that watched 10-seconds of my “behind-the-scenes” video with a Custom Audience. I then invite viewers to visit our website where we share more tips for a perfect coffee nook at home (and also happen to sell coffee decorations). This ad gets shared a few times and Facebook users are now starting to LIKE my brand and content. Here comes the fun part… I now have a warmer audience to re-market to! I create my final sequence by creating another Custom Audience consisting of people that went to my website from the previous ad. I know these people are somewhat interested because they went to my website and looked at my products for sale there. My final ad is a Dynamic Product Ad that shows people the items they looked at on my website previously. Now the ad is encouraging viewers to go to my website and shop for the items that they viewed on my site previously. We finally are starting to see sales, I’m happy and now enjoy running Facebook ads. 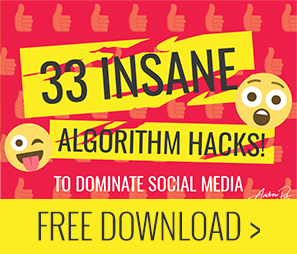 I’ve compiled The Ultimate Facebook Audience Checklist, a list of the top 22 audiences you should target with your Facebook advertising. 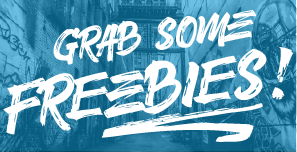 Since you are friends of Andrew and Pete, you can download it and get ahead of your competition as my free gift to you. You must test your ads and audiences. Examples that I have shown are typical, but different businesses have different goals and expectations. Your 30-day Custom Website Audience might perform better than your 7-day audience. You won’t know which audiences perform best unless you test them. Also note that despite this strategy, you still need to create great ads, headlines, and content that resonates with your target audience. You could have the perfect ad sequencing in place, but if people hate your ads and aren’t motivated to engage with them, you must work to improve them. First, ensure you have your analytics and Facebook pixel set up and installed properly. Without it, you will struggle to create valuable Custom Audiences and won’t know which ads are actually converting for you. Saved and Lookalike Audiences are colder audiences and you must treat them as such. 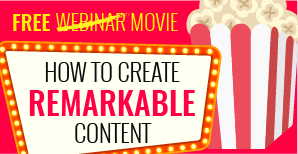 Warm up your cold audiences as they progress down your funnel. Provide VALUE to customers, so they begin to LIKE your brand. Then sell to your hot prospects that have shown they are interested. Tony Christensen is a self-proclaimed, “marketing nerd” who is obsessed with Facebook, Instagram and Google advertising. Currently, Christensen is a full-time freelancer with his sights set on starting an agency of his own. 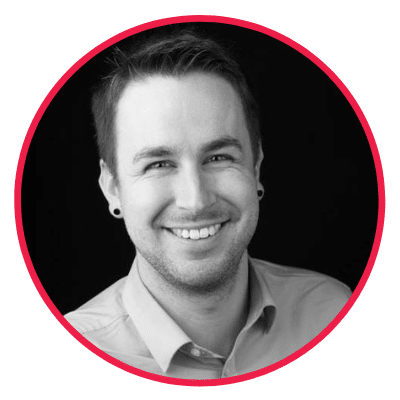 He specialises in diving into data to see where people can improve their advertising campaigns. He has a passion for helping business owners positively impact the lives of people. In his free time, he creates marketing tutorials on his YouTube channel and records pop music. He loves connecting with people on Twitter, spreading positivity and empowering people to go after their biggest dreams…life is too short not to!